Damian McKenzie will miss the World Cup with a knee injury. 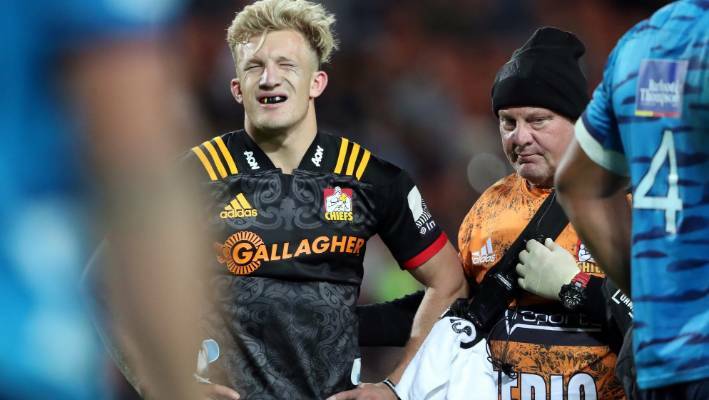 All Blacks utility Damian McKenzie has been ruled out of the 2019 Rugby World Cup with a knee injury. Coach Steve Hansen, speaking to media at the All Blacks first "foundation day" in Wellington on Monday, confirmed the 23-year-old ruptured his ACL in his right-knee playing for the Chiefs against the Blues on Saturday night. "Yeah he's he's done an ACL so [it] looks like he could be out for eight to nine months, which is a real shame for him," Hansen said. "His World Cup opportunity is gone [but] he'll still be young enough to make probably the next two. 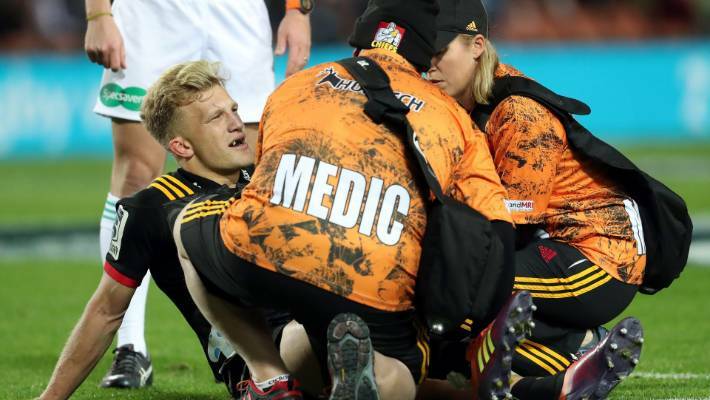 Chiefs utility Damian McKenzie limps off the field against the Blues in Hamilton on Saturday night. "It's just important that he gets his knee right and takes his time to come back and achieve the dreams that he wants to achieve." "Our task is finding someone else to fill his role and his task is getting the knee right to be able to play the game." Hansen said the All Blacks still had Beauden Barrett and Richie Mo'unga as first five-eighths options while Ben Smith and Jordie Barrett can cover fullback. McKenzie left the encounter in Hamilton in the first minute of the second half, after clashing with Blues first-five eighth Otere Black and playing no further part in the 33-29 win. Given the World Cup in Japan kicks off in a little more than five months, the door has been opened for another first-five eighth to join Beauden Barrett and Richie Mo'unga in the All Blacks frame. It's a significant blow to the All Blacks given McKenzie's utility value. He was both an option at first-five eighth and fullback, and provided a reliable goal-kicking option. McKenzie, who has 23 All Blacks caps,, was picked as one of 41 players to attend Monday's foundation day. Crusaders first-five eighth Brett Cameron, who made his All Blacks debut against Japan last year, could come into the equation, although his form has been patchy in his limited opportunities for the red and black so far this year. Meanwhile, Hansen had better progneses for injured All Blacks midfielder Sonny Bill Williams and flanker Sam Cane. He said Williams "had his knee trimmed up" and Hansen was confident he would come back. "Many people come back from cartilage injuries so that's not a concern but if he gets back and plays four or five games, bingo, he's going to play some good footy we saw the other night he played well. Cane has resumed light contact training with the Chiefs after breaking in his neck in the All Blacks' test against South Africa in Pretoria last October. "He's back into contact which is wonderful news and he's just got to take his time there. I'm sure Coops [Chiefs coach Colin Cooper] and his team will bring him back when they think he's ready. "What is important is he comes back when he is ready and he is confident. Coming off an injury like that there is a lot of confidence and mind [issues] that you have to come through as well as the injury side."